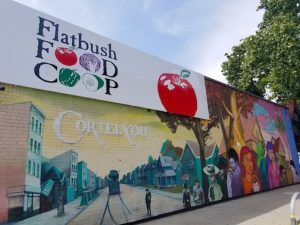 New Member Co-op: Welcome, Flatbush Food Co-op! The Neighboring Food Co-op Association (NFCA) is proud to welcome Flatbush Food Co-op in Brooklyn, NY, as its newest Member Co-op! Founded in 1976 when a small group of community members founded a buying club to bring organic food to Brooklyn, Flatbush Food Co-op has since established itself as a successful co-operative with more than 3,000 members and $17 million in revenue that works to serve the entire community. Like most food co-ops, Flatbush Food Co-op began with a small group of community-minded people with big ideas. In this case, 11 people concerned about the environment and interested in organic food established what was then called the Tenth Street Co-op to pre-order dry goods and later organic fruits and vegetables. In 1979, Members opened their first retail storefront as 16th Street Co-op and a year later hired Barry Smith, one of volunteer managers and original founding members, as their first paid General Manager. In 1985, the Co-op moved to a 2,100 square foot storefront on Cortelyou Road in Brooklyn, changing its name to Flatbush Food Co-op. During their 23 years at this location, the Co-op’s membership grew from 300 to more than 3,000 and from a staff from five to 25, while sales grew tenfold. After a decade at this site the Co-op eventually moved to its current at 1415 Cortelyou Road, a location with three times the retail space. The NFCA includes over 35 food co-ops and start-ups across New England that are working together toward a vision a thriving co-operative economy, rooted in a healthy, just and sustainable food system and a vibrant community of co-operative enterprise. For a map of your Neighboring Food Co-ops, please visit http://nfca.coop/members. In 2008, the food co-ops that would later form the Neighboring F ood Co-op Association (NFCA) took a major step in understanding their collective economic impact by commissioning a study. The study told a powerful story of the impact that food co-ops were already having in the region. A decade later, what has changed? A little over a decade ago, the co-ops that would later form theNeighboring Food Co-op Association (NFCA) took a major step in understanding their collective economic impact. With support from the Brattleboro Food Co-op and Co-op Food Stores, they hired independent economic analyst Doug Hoffer to undertake a study of member co-ops in Vermont, Massachusetts, New Hampshire and Connecticut to collect and analyze data about their impact on the regional economy. The study told a powerful story of the impact that food co-ops were already having in the region. For example, even the 17 co-ops included in the original study were surprised to learn that they had a combined membership of 64,000 people and aggregate annual sales exceeding $161 million. Further, these co-ops also had a dramatic impact in the regional economy, including local purchases of more than $30 million and over 1,200 employees. Taken together, the Vermont food co-ops were among the top 25 employers in the state! A decade later, the NFCA has been surveying the co-ops that participated in the original study to see what has changed over the past 10 years. In the wake of the global recession and increased competition, how have food co-ops in our region fared? Sales of Local Products grew 23%, from an estimated $52.4 million to $64.7 million. Staff Wages grew 69%, from $28.6 million to almost $48.3 million, reflecting the commitment of food co-ops to sustainable jobs. These numbers show exciting growth and help tell the story of the important contribution our food co-ops to more stable and resilient local economies. And as our co-operative of food co-ops has grown to include over 35 food co-ops and start-up initiatives, so has our collective impact. Together, we are growing a more healthy, just, and sustainable regional food system and economy. Join your Neighboring Food Co-ops at the NOFA Summer Conference for this Track of Co-op Workshops THIS WEEKEND! The Neighboring Food Co-op Association (NFCA) is proud to sponsor a special track of workshops and presentations on “Co-operatives in the Food System” this weekend at the 44th Annual NOFA Summer Conference focused on “Honoring Our Roots, Tending Our Future,” August 10-12, 2018 at Hampshire College in Amherst, MA. And, Members of NFCA Co-ops receive a 20% DISCOUNT with the code “NFCA20”! This year’s conference program will celebrate the wisdom of the rich indigenous agricultural past that has provided the basis of the organic movement and the ecologically based practices we have used to be successful. Keynote speakers, Rowen White and Eric Holt-Giménez, are two passionate, ambitious educators, both working diligently to share their knowledge and experience with small agricultural communities. Co-op Track workshops, which will take place on Saturday, August 11, 2018 in ASH 222, address a variety of the ways co-operative enterprises are contributing to a more healthy, just and sustainable food system, including how food co-ops are strengthening food security and empowering people to build sustainable food systems, practical steps for small producers and co-ops to comply with new food safety rules, launching a new co-op or converting an existing business. 8:00-9:30 am: “Update on Food Safety Rules for Small Producers & Co-ops” with Roger Noonan (NEFU) (New England Farmers Union) & Vicki Smith: Food Safety Specialist, New England Farmers Union (NEFU). 1:00-2:30 pm: “A Legacy of Food Security: History of Food Co-ops in the Northeast” with Bonnie Hudspeth (Membership Programs Manager, Neighboring Food Co-op Association) & Suzette Snow-Cobb (Sourcing Coordinator, Neighboring Food Co-op Association). Members of NFCA Co-ops receive a 20% DISCOUNT with the code “NFCA20”! Join Neighboring Food Co-op Association (NFCA) this November 1 – 3, 2018 (Greenfield, MA) for an interactive intensive professional development opportunity focused on leading thinking in co-operative management coupled with tangible examples of how to translate knowledge into action. Who should come? We encourage CEOs/General Managers, senior managers, board members and keen employees to join us for this learning and networking event. “The Saint Mary’s University Executive Sessions are among the most inspiring and thought-provoking events I have attended. 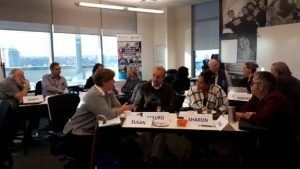 I attended two sessions and I would recommend them for anyone who is in a position of strategic leadership at their co-op. Côté covers an amazing breadth and depth of material, and the opportunity to connect and learn from other attendees adds even more value to the experience.” ~ Susanna Schultz, Marketing Director, Central Co-op. Billings Farm was established in 1871 by Frederick Billings, a native Vermonter known for his work as a lawyer, railroad builder, and pioneer in scientific farm management and reforestation. Billings set out to make his 270-acre Woodstock farm a model dairy operation for farmers in the region, founded on the principles of efficiency, sustainability, and responsible land use. Now operating as the Billings Farm & Museum, cheese making is part of the 150-year tradition of dairy excellence. Billings Farm Cheddar is made from 100% raw milk exclusively from the Billings herd of over 40 purebred registered Jersey cows, with no additives, preservatives, or artificial coloring. Butter Cheddar, also known as Butterkäse, is mild and creamy with a slightly salty or acidic taste reminiscent of Muenster or Gouda cheeses. Known for its delicate flavor, it literally melts in your mouth. Butter Cheddar is a very child-friendly cheese that is also well suited to classics such as grilled cheese and mac n’ cheese. 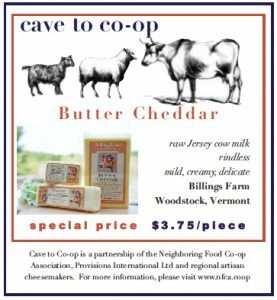 Cave to Co-op is a partnership between Provisions International and the Neighboring Food Co-op Association (NFCA) to support artisanal cheese producers in our region and make their products more easily available to co-op shoppers. Each month, a delicious local cheese is featured at a great price. Head back to school (or work!) with easy to make lunches using frozen fruits and veggies grown in our region. 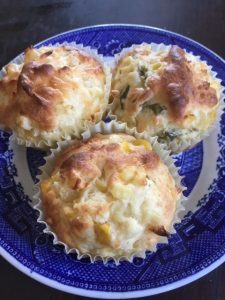 Try this Corny Muffin recipe for a quick to make, and easy to transport nutritious lunch item. Your local food co-op works hard to support our local farmers and offer healthy ingredients for your family. Over the last two years, food co-op shoppers have purchased over 11 tons of Neighboring Food Co-op Association (NFCA) Blueberries, Organic Broccoli, Organic Edamame, Organic Green Beans, and non-GMO Sweet Corn — all grown and packaged right here in the Northeast, and available only at your food co-op! Pre-heat oven to 400°. Mix dry ingredients together. In a separate bowl, whisk together the milk, eggs, butter and honey. Add to dry and stir until just mixed. Gently fold in corn. Fill paper-lined muffin tins 2/3 full. Bake 15 minutes or until toothpick inserted in the center, comes out clean. Cool. Variation: add chopped jalapeno or shredded cheddar cheese to wet ingredients. The vision of the Neighboring Food Co-op Association (NFCA) is of a thriving co-operative economy, rooted in a healthy, just and sustainable food system and a vibrant community of co-operative enterprise. Eat healthy and contribute to community building! Look for our Northeast Grown Frozen Fruits and Vegetables in the freezer section. They’re easy to find because they’re packed in a clear package, so you can see what’s inside! For more Farm to Freezer information and recipes — including easy to prepare recipes great for lunches, using frozen corn and other Farm to Freezer products — visit: www.nfca.coop/farmtofreezer. In a letter sent to congressional leadership, National Farmers Union (NFU) President Roger Johnson emphasized the need to address agricultural economic hardships in the 2018 Farm Bill. Farmers and farm advocates interested in advocating a strong farm bill are encouraged to visit 2018FarmBill.org to learn more about the farm bill and information on how to contact members of Congress. NFCA Member Co-ops Receive a Discount in Registration.